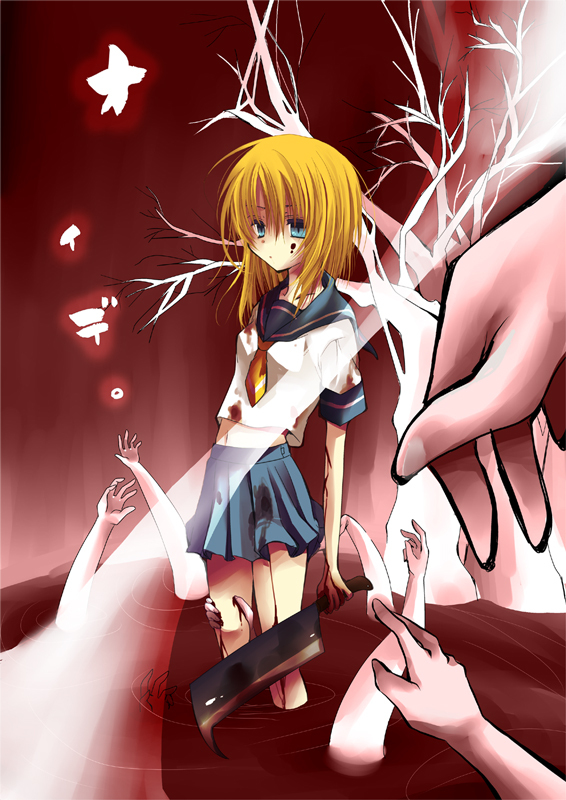 Oh Rena you silly yandere you. Higurashi no Naku Koro ni (aka Higurashi – When They Cry) is the first entry in the When They Cry series, the second being Higurashi no Naku Koro ni Kai, the third being Umineko no Naku Koro ni, and the fourth being Umineko no Naku Koro ni Chiru. The “When They Cry” series is written by the doujin group 07th Expansion, and the main writer is a guy called Ryukishi07. “Higurashi no Naku Koro ni” has just recently been released by MangaGamers, with “Higurashi no Naku Koro ni Kai” slated for a February release. Of course, you, the reader, should know all this. At least, the people who’d bother reading an entry about Higurashi should know this. Anyways, I’ve recently…acquired…the Visual Novel (or Sound Novel if you prefer), and I’ve just finished reading Onikakushi-hen, also known as the Abducted by Demons Arc. The first thing I notice (after the bad art) is that Higurashi is more of a comedy/drama/tragedy than a horror, although it does contain horror elements. The second thing I noticed is that Ryukishi has drastically improved by the time he got to Umineko. Maybe it’s just the fact that I know everything that happens in Onikakushi-hen that made it seem kinda bland. I dunno. There weren’t many differences between the VN/manga/sort of the anime, but the biggest difference imo is the lack of impact when Rena and Mion denied knowing anything about the Hinamizawa dam project. Actually, between the VN and the manga, I think I might prefer the manga (for now). Probably if I was experiencing Higurashi for the first time I’d feel differently about this. But one thing the VN has over everything else are the club games. They’re much more epic in the VN, complete with hot-blooded music and Keiichi being awesome. And zombie tag. And Rena being a pervert. And Rika being way more moe than her manga/anime counterpart. Although the TIPS do give more insight on the story. Just some extra tidbits of information the manga/anime didn’t include.